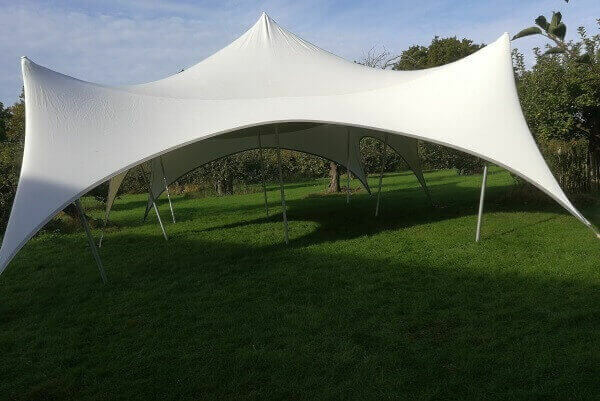 Our premium trapeze marquees for hire in Kent and East Sussex are ideal for weddings, garden parties, events and other functions. 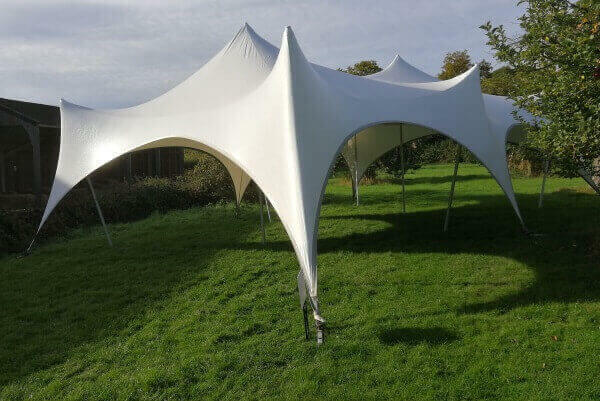 They are stylish and offer greatly improved wind, rain and general weather ratings other over types of marquee. They can be used all year round in most weather conditions. 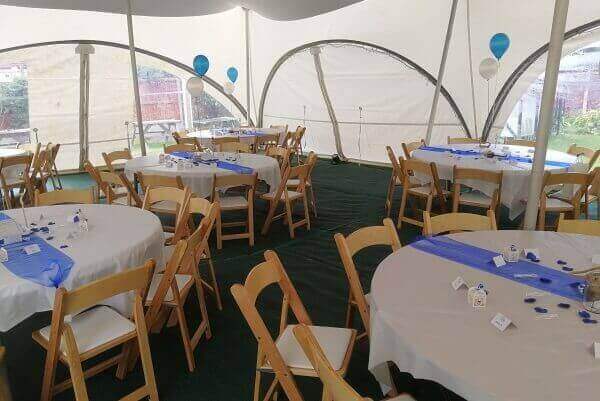 We offer two different sizes in the trapeze marquee - 30ft x 40ft & 20ft x 30ft. 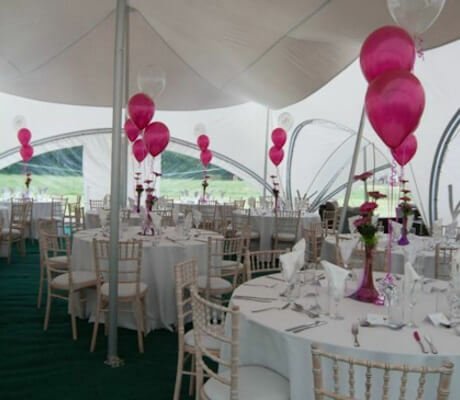 There are many different layout options which can be achieved with a trapeze marquee, making them the perfect choice for your special day. See below for some of the possible layouts. 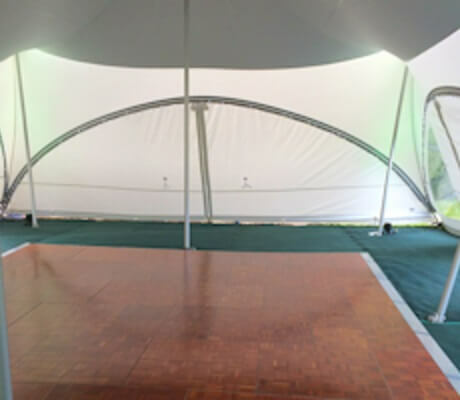 We also offer capri marquees for hire, which provide an alternative to the trapeze, however they are not as wind resistant. 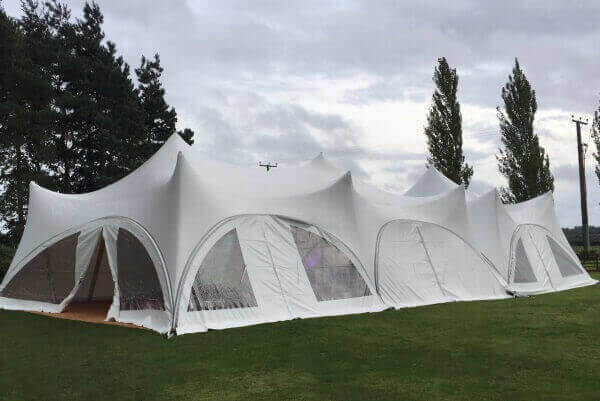 Trapeze marquees can withstand a maximum of 60mph winds, with the capri marquee only withstanding up to 30mph winds. 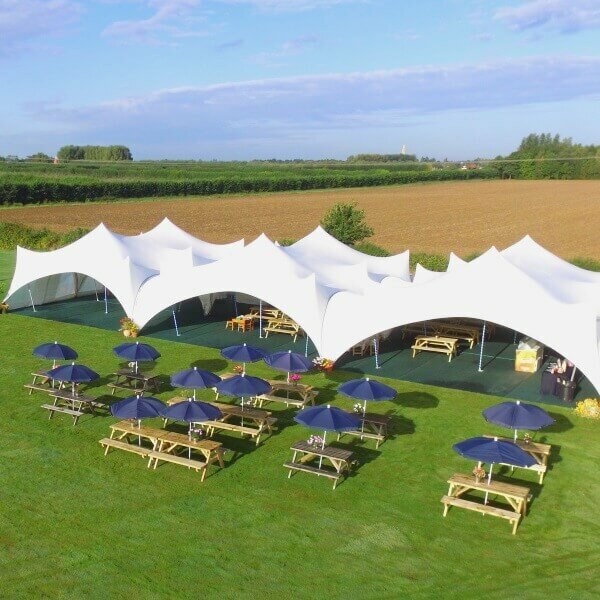 Remember, we are here to help, so if you have any questions or would like to hire one of our marquees, please do not hestiate to contact us. You can call or you can email us, or alternatively, why not take a look at our Facebook page to see some pictures of various events we have covered? 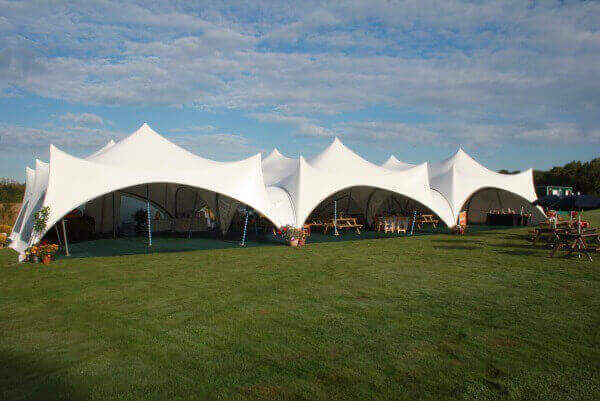 Trapeze marquees offer superior weather resistance compared to standard capri marquees. They can be used in various weather conditions, including high wind conditions (up to 60mph) and rain. 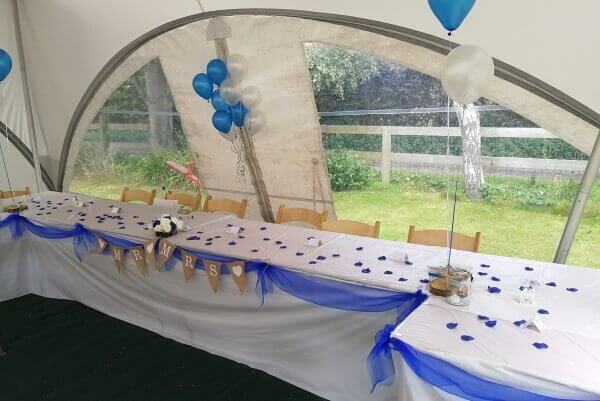 Hire one of our marquees and ensure that your event doesn't get rained off. 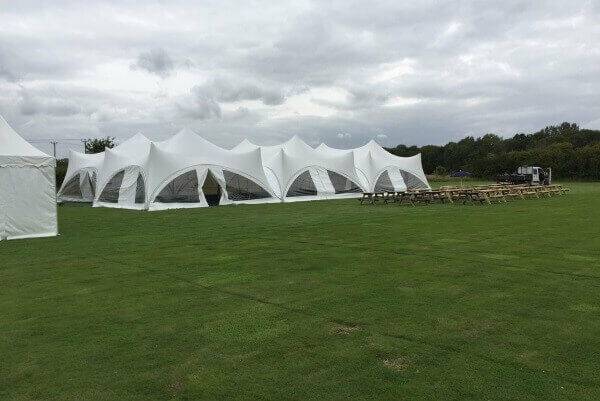 It's well worth investing in a trapeze marquee for your wedding, as British weather is unpredictable and you don't want the rain to spoil your special day. We are the only company in Kent to offer trapeze marquees for hire. There are two types of marquee wall panels to go with the trapeze marquees. Your options are either a solid wall or window, both of which can be unzipped for access and ventilation. Alternatively, you can have the sides open. All walls can be set up to suit your event and we will advise you on the best options for your layout and weather conditions. 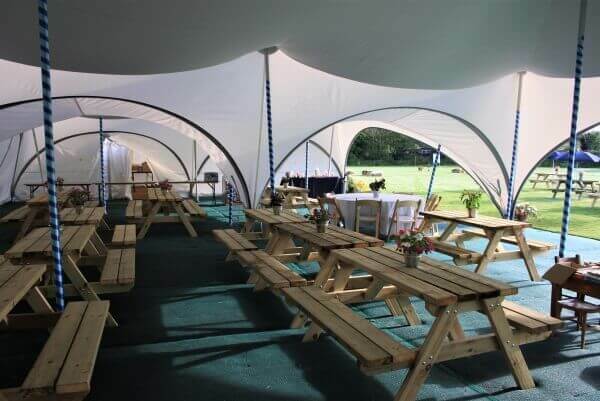 The trapeze marquees are the next generation to the Esprit and Capri marquees and are the best choice for many events. 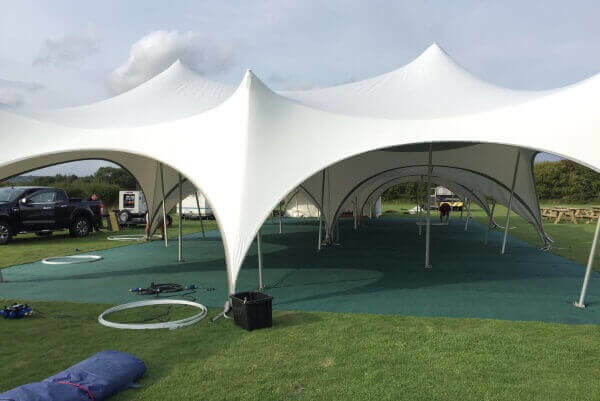 Some of the benefits of a trapeze marquee is that you can have various different layouts to suit your requirements. 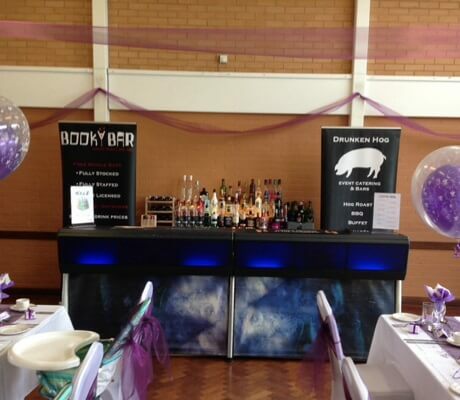 If you are planning a wedding, then you need to take a look at our How To Book page, as it gives you all the tips and pointers you need to arrange your wedding reception, including what you will need, how to plan your layout and what we can do to help, as well as frequently asked questions. We offer lots of different accessories to go with your marquee, including dancefloors, furniture, bars, disco equipment and power supplies. Send us an email or give us a call to discuss your exact requirements and we will tailor make a package especially for you. 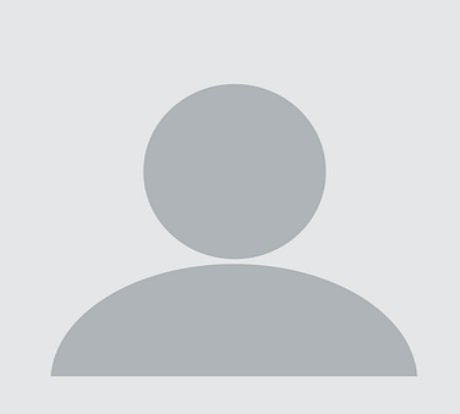 All layouts below are for example purposes only. 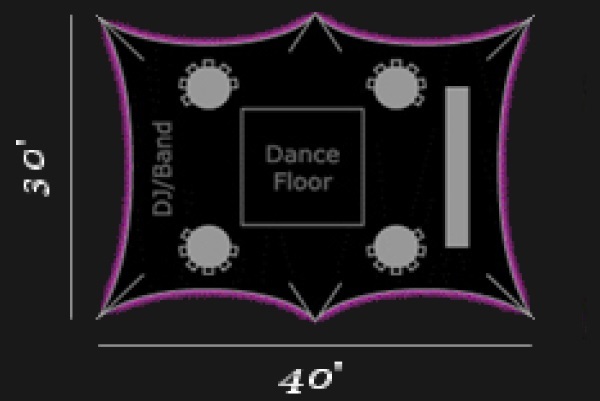 We can help you decide your ideal layout for your event. 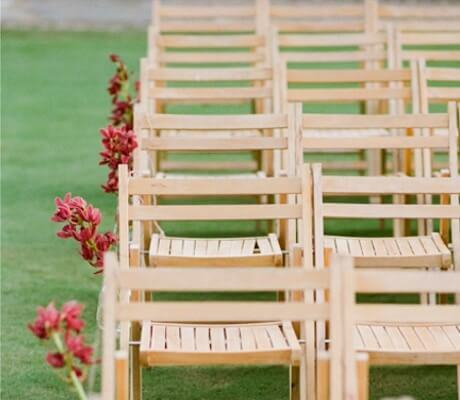 This layout is for small weddings or parties where not many people will be seated. 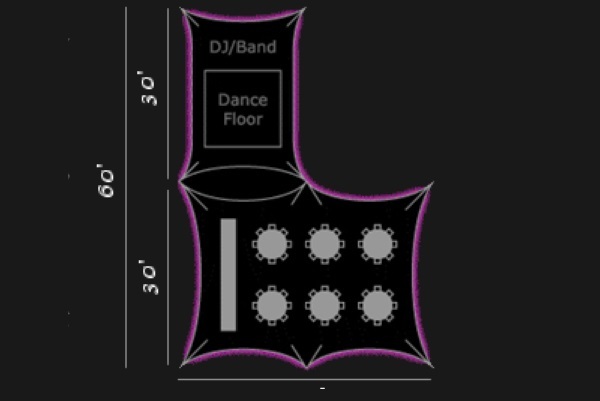 The main view is of the dance floor and DJ with bar area at the end. 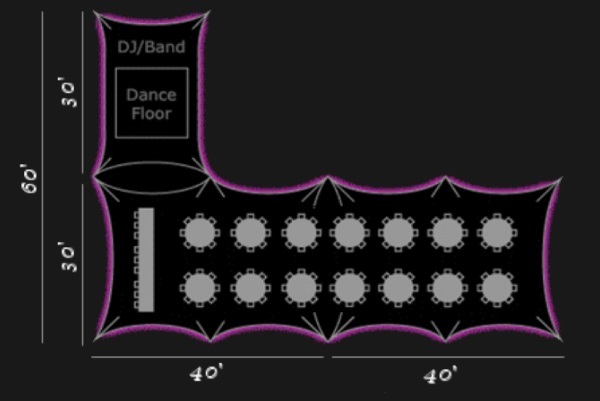 This layout encorporates both a 20ft x 30ft and 30ft x 40ft marquee, set as an L shape to offer an area for the disco or a band as well as seated guests. 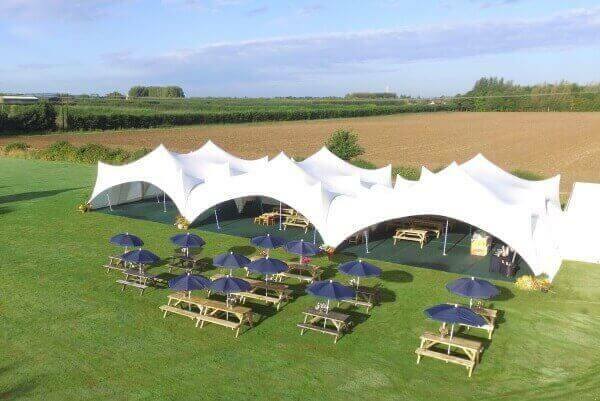 For larger weddings and events, we can set up 3 marquees to provide a large seating area for your guests, as well as a dance floor area with DJ or band. 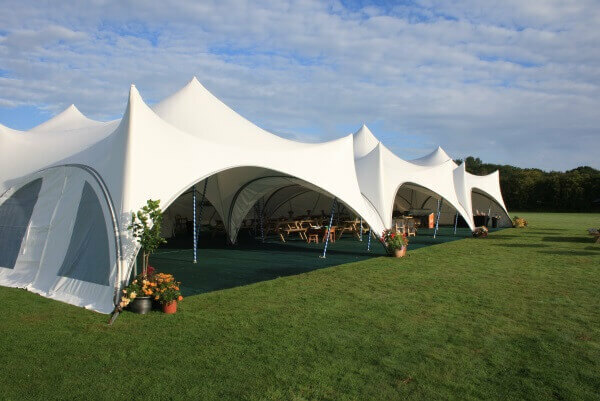 It is essential to choose the right accessories to go with your marquee. 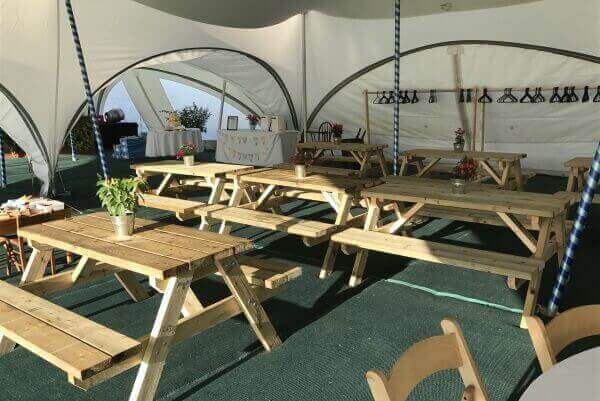 You'll definitely need marquee flooring, of which we offer two different types, as well as tables and chairs for people to be able to sit down at your special event or wedding. We offer many different options for tables and chairs, including trestle tables, round tables, benches, wooden chairs or something more casual like bean bags and poseur tables and stools. You need to think about toilets and power supply if these are not already on site. Contact us and we will be more than happy to talk through your requirements with you and help you plan what you need to ensure a perfect day.